Who Needs Zagat's When You Can Just Count Pickup Trucks? My small family (well, small if you restrict yourself to counting just the humans; there are only three of us) just moved from the hinterlands barely outside Jacksonville to the hinterlands barely outside Cabot. We're still in that odd no-man's-land that is neither town, but technically, we reside in one now instead of technically residing in the other. And the same goes for counties: where we were previously just in Pulaski County, now we are just in Lonoke County, by the skin of our teeth. So it is that we are having to orient ourselves to new routines, new telephone prefixes (and the fact that, even though we've only moved 5 miles, now all of our cell phone numbers are LONG DISTANCE CALLS from our home) new routes to and from work--different ones at different times of the day, for maximum efficiency, as it turns out--different layouts of chain grocery and discount stores that really, by law, ought to have to be organized in precisely the same manner no matter where you find them, under severe penalty of some sort if you must walk more than a quarter of a mile to find, for example, aspirin or fish-food, and of course, different "good places t'eat." It was a recent, unusual (in that we did not happen to be at work on this day) Friday morning that found us, by way of highly-energetic preschooler wakeup-call, up and at 'em at a distinctly earlier hour than is, um, let's just say EVER HEARD OF for us on a day OFF. So, knowing an unopposable force when we see one, we decided to just roll with it instead of resisting, and that we'd get all our usual Saturday chores (shopping at the grocery store, the feed store, and if need be, the Large Blue Discount Chain Store Native to Arkansas) done a day early and during the morning hours, and get home in time for lunch and then a blissful family nap! You betcha! And on top of that bit of brilliance, came the bonus lightning-flash: "Hey, we could go out for breakfast first!" But as all our errands were now being run in a different town (except for the feed store--that stop is same as it ever was, and I'd imagine I'll be handing over a significant portion of my paycheck to Fred Wood for as long as he's in business or I still have horses, whichever lasts longer), we were given pause. Where to go? Well, what were our choices? Aside from fast food, we realized that we really had no idea. Alex brought up the conveniently-located National Breakfast "House" Chain Restaurant That Does Not Have the Word "Pancake" in Its Name, and I, uh...well, I suppose the polite way to put it is to say that I demurred. Vigorously. And fled to my laptop, and precious, precious Google, to search for sit-down restaurants that offered breakfast in the area of our planned errands. There was ONE listed. The name alone offered little clue as to its quality: "Jane's Kitchen." Well, I'm not shy, and I'm not one to mince words much, and if there's one thing I've learned from living in Arkansas for thirty-mumble years, it is that if you ask an honest question, you're more than likely gonna get an honest answer, if only because it's faster and just makes life easier. 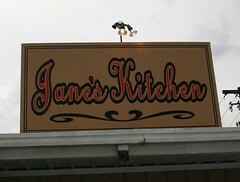 Ignoring the sighing and eye-rolling coming from my husband, I picked up the phone and called Jane's Kitchen right up. I asked the friendly lady who answered the phone, "Do you serve a better breakfast than National Breakfast "House" Chain Restaurant That Does Not Have the Word "Pancake" in Its Name?" The first good sign was the length of time that it took the good lady to stop LAUGHING before she could catch her breath and answer me, and the next was her unhesitating response of, "Oh, LORD, yes, Honey!" We were off and running. When we arrived at Jane's, which was right around the corner from the feed store I've been frequenting for 10 years or more, we were further comforted by the bold statement painted on the glass, pictured at the top of this article. 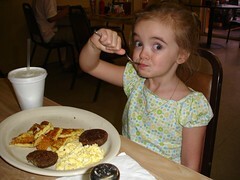 It assured us that the breakfast at Jane's had been voted, we hoped by at least a good handful of folks, "Best Breakfast in Lonoke County." Well, that's a start! But Husband and I, we are Arkies at heart, and rural Arkies, for the most part, at that, so our ultimate pre-dining assessment came not from the sign on the window, but from the signs in the parking lot. If you've lived here any length of time, you know what I mean. I'm talking pickup count. And Jane's did NOT disappoint in this regard. And apropos of not much, I feel compelled to mention that, while we were breakfasting on this particular morning in August, as we were finishing up, about 20 members of the local high school football team came in, and Alex informed me that they had probably just begun their "two-a-days" and had come by post-practice, and were filling up on some serious teenage-boy-with-hollow-leg rations before heading home to relax (and according to Alex, probably nap) until time for the day's afternoon practice. Typical breakfast orders we overheard being placed--for ONE person, you understand--were along these lines: "Biscuits and gravy, double order of bacon, pancakes, and sausage." Do you have any idea what I would give for the metabolism of a teenage boy? DO YOU?!? What impressed me about these young "jocks," however, was not their appetites, but rather their manners, which were impeccable. Although totally unattended by any adult presence whatsoever, their voices were quiet, their tables stayed neat and clean, and every conversational exchange with restaurant staff was peppered liberally with "yes, ma'ams" and "no, ma'ams", and "thank you, ma'ams". Our table was right next to theirs, and I heard not one offensive statement or a single word of foul language. They were freshly showered, fresh-faced, and appeared, to my nearly forty-year-old self, to be approximately 12 years old, each and every one of them. So if you're the parent of a Cabot ballplayer that frequented Jane's for breakfast after summer practices, give yourself a little pat on the back for a job well done. SO: What of it, citizens of Lonoke County and North Pulaski County? Do you have any other favorite breakfast (or lunch) joints that we should check out, or is Jane's Kitchen indeed the "Best Breakfast in Lonoke County," without challenger? It was pretty darned good by our account, and we'd sure love to know if there are more such "hidden in plain sight" treasures, not limited to restaurants, in the area, that we might've been missing!